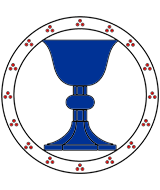 Fieldless, a chalice azure within and conjoined to an annulet argent estencelly gules. The Order of the Azure Chalice recognizes individuals who have provided exemplary and long-standing service and dedication to the Barony, and who have done such work as to add to the enduring legacy of the Cleftlands. Members of this order shall have the right to bear the badge: (Fieldless) A chalice azure within and conjoined to an annulet argent estencelly gules. Established in 2017 by Baron Crispin and Baroness Gianna. There is no Order of Precedence (OP) abbreviation for this award. Immense wealth is symbolized by the overflowing cup, as the bounty is so great that it can not be contained within a single vessel. The Barony of the Cleftlands  is in this manner enriched by the people who rally under her banner. We, <BARON & BARONESS>, <#BARON> Baron and Baroness of our line, know well that there are many among our ranks who dedicate themselves to the cultivation of our plentiful lands. Their acts have shaped not only the landscape, but the very bedrock upon which the barony nobly stands. It is this tireless service in all forms which contributes to our shared prosperity and enriches our populace so that the Barony of the Cleftlands remain a fertile field in which the seeds of dreams may grow. That which nourishes these lands where the river once burned must be celebrated. Henceforth, let it be known to all nobles and gentles present that is both our honor and privilege to recognize <NAME> as a member of our Order of the Azure Chalice. With this distinction is granted the right to bear the badge, Fieldless, a chalice azure within and conjoined to an annulet argent estencelly gules, henceforth without let or hindrance. Done by our hands this <DAY> day of <MONTH>, Anno Societatis <AS_YEAR>, at our <EVENT_NAME>. Pages in category "Order of the Azure Chalice"
This page was last edited on 3 January 2018, at 13:44.